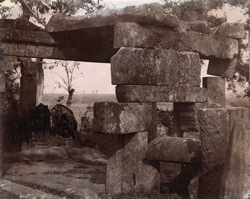 Photograph of a portion of a ruined temple, with sculptured slabs in background, at Mandaur, Gaya District, taken by Joseph David Beglar around the 1870s. The temple is located in the modern state of Bihar and is in a ruinous condition. Concerning Mandaur, the Bengal list reads, 'The ruins here, six miles north of Gaya on the Phalgu River, consist of a temple of which some pillars are still standing, and some very fine pieces of sculpture. The pillars and architraves are in a dangerous state, and something ought to be done to prevent a collapse and the destruction of what exists...Some of the sculptures are excellent and deserve preservation.' The indistinctly seen group of sculptures are identified as follows in Bloch's list: Ganesha, Shiva, Surya and Vishnu.